24HR locksmith service is necessary especially for emergency lockouts or other emergency locksmith issues. When you call 24HR locksmith, you can feel comfortable to call during nights, weekends, and holidays. You don’t need to feel you bother anyone because 24HR locksmith is open 24 hour a day, 7 days a week. How easy it can be when you call locksmith any time you need and you can get immediate service? Imagine what could happen if you lock yourself out in the weekend and no locksmith is available. That could be a major issue. Unlike many other locksmiths, here, at LockTech24/7 we’re working all the time. There is not even a single moment during a day that we don’t provide professional locksmith services. Every time you need emergency locksmith in Allentown, we are here to help. In hot days or snowing month, we’re still on the road serving people day or night. You can count on our 24HR locksmiths to be there any time you need professional locksmith services. 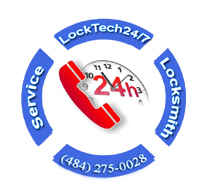 24HR Allentown Emergency Locksmith at LockTech24/7 is one-stop mobile locksmith shop. We do all locksmith services such as automotive locksmith, residential locksmith, and commercial locksmith. Whether you need emergency service or to schedule locksmith service, we can do it in your convenience. No matter time during a day, and no matter what service you need during a night. Our 24HR emergency locksmith services are available in Easton, Bethlehem, and especially in Allentown PA, supported by 20 minutes response time. Yes, you read it right, 20 minutes from your first call until our locksmith shows up on-site. Please don’t hesitate to call us day or night, we will be happy to assist you. You can also contact us via email if you would like to schedule service. 24HR Locksmith services, lock & key solutions to automotive, residential, and commercial owners. Please call us now and experience an excellent customer service, unique locksmith solutions, and outstanding locksmith results with attention to affordable price.